- A great combination of led night light and usb charger! Now you don't have to turn on a light to see plug in to charge your tablet or phone. 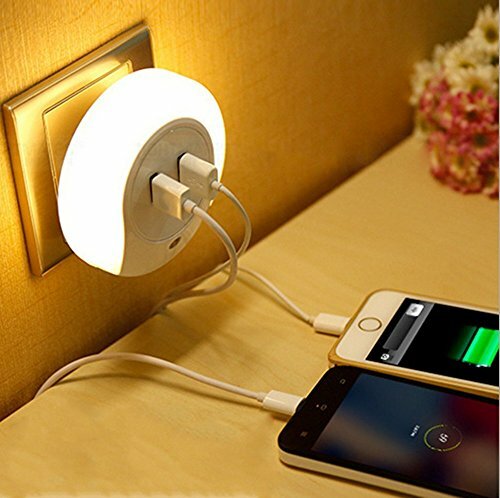 - With its soothing warm light automatically in darkness, just plug it in a wall outlet and enjoy its convenience for charging two device simultaneously. - The light is perfect at 3.5" in diameter, larger than some other night lights, providing ample illumination at night with a soft light. Good guide light in darkness, using in hallway, bedroom, kitchen, bathroom, living room, corridor etc. To help you and your family to see clearly without turn on the bulb when you get up in the late night. - Don't forget that you can also light it on or off manually by repositioning the switch. Switch to 'ON' so that the led light is always on, and there is no auto-sensing. Slide the switch to 'AUTO' to activate the light sensor capability, automatically turns light on at dusk, and off at dawn. Switch to 'OFF', is closing condition and saving energy. - Dual standard USB charging outlets allows full speed charging for 2 smartphones or 1 tablet. 2A output when only charge one device ,1A output for each port when charge two device at the same time. 1.Remember to only use quality cables: To ensure complete safety and best performance, we strongly recommend using your device's original cable or a third-party certified one (such as MFI). 2.Avoid charging in a confined spaces: To ensure against overheating, avoid using the charger in confined spaces or in higher than room temperature environments. THREE LIGHT MODES - Auto-Control light sensor night light activates in darkness, automatically turns on at dusk and off at dawn (under AUTO mode). Also you can turn the light on or off manually by sliding the switch. DUAL USB WALL CHARGER - Compatible with all 5V devices, such as iPhone, iPad, Android smart phones, tablet, camera, PSP,etc. DC 5V 2A output for two ports, allows full speed charging for 2 smart phones or 1 tablet.